If you are looking for a fine meat diner in a relaxing atmosphere, you should go to Moses. In spite of being located at busy Rothschild boulevard, the noise doesn't penetrate the glass walls of the nice terras. Moses is especially known for it's mouthwatering hamburger. For Tel Avivians, Moses and Agadir are on the top of the burger dining. You can choose between a classic ground beef hamburger or a mixture of beef and lamb (called "art-burger") and get all the great sauces you need, and add fries, salads, fried onion and etc. as side dishes. The salads are big enough for 2-3 people (the red cabbage one fits the hamburger well). For good dining, pick one of the special (but a bit pricy) grill and pan dishes. Moses also has vegetarian burgers made of tofu. Moses has special promotions for their gala dish - the art-burger - from midnight on. 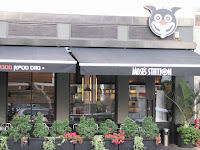 At Moses restaurant you can get it for half price; at MosesStation you get the Art-burger and a sidedish for 33 NIS. FYI: MosesStation has less variety than Rothschild branch, and designed more like a modern diner rather than a restaurant. But if you rather feel like eating something more simple but good, cross the street and eat great hummus at Asli. Rothschild branch is near the intersection of Rothschild with Allenby, can be reached with bus no. 5. MosesStation is near the northern end of Dizengoff st.
* Detail: the only way to get to the restrooms in the Moses restaurant is by taking the elevator.